One word summary for the book- “Mutt”. This story is about two talking dogs, waiting to get out of the pound, that dig up a book about positivity, and then read to each other. ? I believe there were two or three other author’s material mentioned, but not even that could spice this thing up. There was very little new information or ideas in this book, in my opinion. If Old Mother Hubbard went to this cupboard to get her poor dog a bone, I’m afraid the old dog might still be hungry. I was when I finished the book. No meat. The saving grace for this book, besides it only taking about two hours to read, is that it would be a great read for a kid. A few pages or chapters a day, and you’ll steer your kid in the right direction. Research from HeartMath shows that feelings can radiate up to five or ten feet in an electromagnetic field from a person. Buy it for a kid, but only for yourself if you’ve never read more than one or two books on positivity. Let me save you $17 (really – $17 ?) – Both dogs get adopted, and then meet each other again as neighbors down the road. IF ONLY a mother dog had died in the first few pages, they could have made a really weak Disney movie out of it. 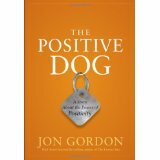 This entry was posted in Book Reviews and tagged Jon Gordon, Positivity, The Positive Dog by MomentumMikey. Bookmark the permalink. I have a section on my blog devoted to books I’ve read. I’m just getting started, but all the books I’ve read and loved about positivity are in a tote, stored in my mother’s basement. I have to wait to get them before I can write anything about them. Would you mind if I shared this info on my page, for other readers to be aware? If not, that’s ok. But I wanted to thank you, as I am CONSTANTLY buying books. My latest 2 are by Shawn Achor. Have you read any of his? If so, any thoughts before I start them?